The extensive deforestation and degradation of tropical forests is a significant contributor to the loss of biodiversity and to global warming. Restoration could potentially mitigate the impacts of deforestation, yet knowledge on how to efficiently allocate funding for restoration is still in its infancy. We systematically prioritize investments in restoration in the tropical landscape of East Kalimantan, Indonesia, and through this application demonstrate the capacity to account for a diverse suite of restoration techniques and forests of varying condition. To achieve this we develop a map of forest degradation for the region, characterized on the basis of aboveground biomass and differentiated by broad forest types. We estimate the costs of restoration as well as the benefits in terms of carbon sequestration and improving the suitability of habitat for threatened mammals through time. When the objective is solely to enhance carbon stocks, then restoration of highly degraded lowland forest is the most cost-effective activity. However, if the objective is to improve the habitat of threatened species, multiple forest types should be restored and this reduces the accumulated carbon by up to 24%. Our analysis framework provides a transparent method for prioritizing where and how restoration should occur in heterogeneous landscapes in order to maximize the benefits for carbon and biodiversity. 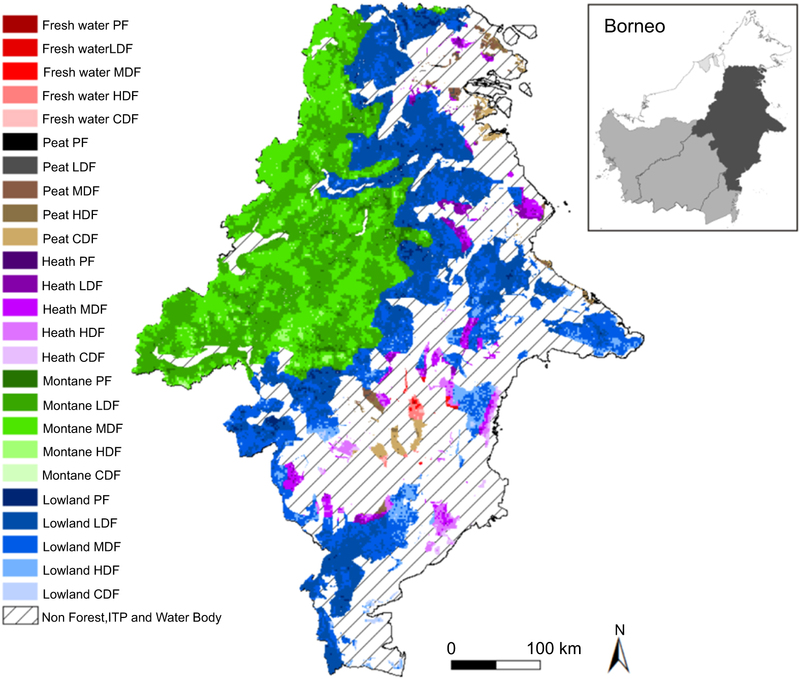 Map of forest condition across forest types in East Kalimantan. The study area is restricted to the Forest Estate with native vegetation under the authority of the Ministry of Forestry and excluded areas of Non-forest Estate, ITP (industrial timber plantation), mangroves, and water bodies. November 24, 2014 in Publications.